Unwrap the beef and pat the meat dry with a paper towel. 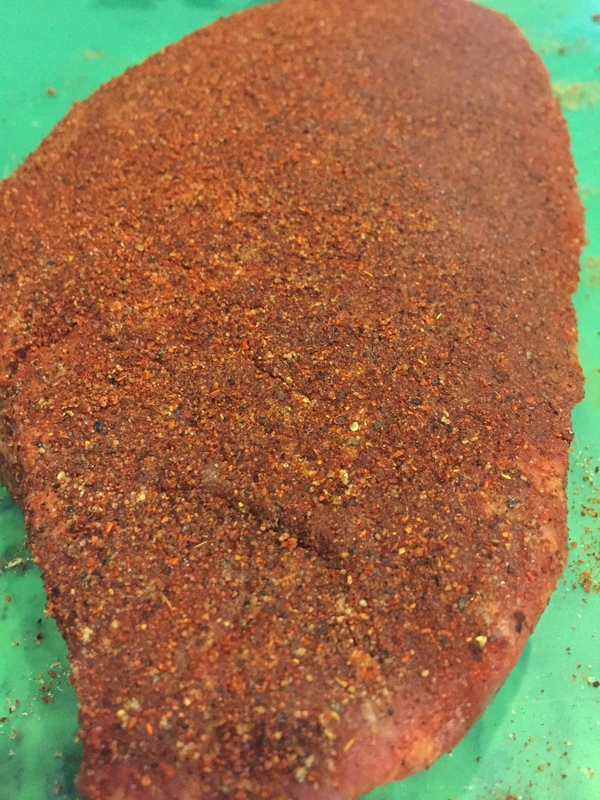 Layer a thin even coat of each spice (above in the order listed) to each side of the beef. Do not apply too much cayenne pepper. I barely sprinkle the cayenne pepper at the end. After applying about 2-3 of the spices, use the back of a fork to pat down the spices onto the beef. Then, add the rest of the spices. Once all spices are applied, pat the spices into the beef with your hands lightly or with the back of a fork. Place meat in container and refrigerate for at least 2 hours. It tastes better the longer it is allowed to "marinate". I will sometimes let it marinate for a day before cooking. You can either cook this under a broiler or grill the meat. I have cooked it both ways and love it either way. In the pictures above, the London Broil is grilled and cooked to medium/medium rare. If you broil: turn oven onto broil. Place meat on cookie sheet and on oven rack close to broiler. If you like your meat medium to medium rare, I would leave meat under broiler for about 5-7 min on each side. (Flip meat over after 5-7 min). Check the meat by slicing it to see if it is cooked to your liking. You want to serve this sliced against (opposite) the grain. Heat onions and peppers in a skillet with a tablespoon of olive oil. Once onion and peppers are cooked well (with all water evaporated if using frozen veggies) add your meat and cooked until well done. Add your meat & veggies to your sandwich bun, and top with your favorite cheese. I used American sliced cheese. Microwave the sandwiches until cheese is melted. I also add mayo to my sandwich after I microwave it. Enjoy!